The resident writer has put pen to paper and fingers to keys and tapped out this gig review. A great night of entertainment eagerly awaited the Bradford Theatre. I'd been looking forward to this event for weeks and it did not disappoint in any way. This old prestigious theatre was a great venue for live entertainment and apparently a dream to play in. So on with the gig.....................................The first band to perform was the local band know as ULTCULT who were a great start to the nights live music.The experimental pop band was full of catchy melodies and up-lifting songs.The gifted quintet were great to watch and made me look forward to seeing them again soon. The second band to do battle with the stage were Nottingham's finest live act, the LOVVERS. What can I say this band was great to see live and well worth the entrance fee and the travel to see them.I love bands who make an effort to make a lot of noise and they achieved this, in bundles! 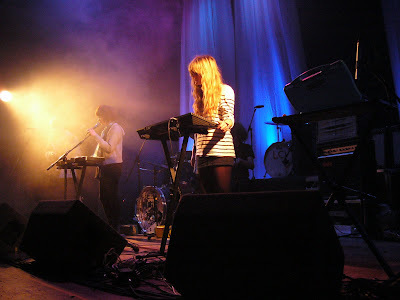 And the last to come on stage was Cardiff's punky pop band LOS CAMPESINOS! This band are a multi-talented seven piece wonder. With their idealistic lyrics and punky-flowery creative music. They created a unique live performance which made my evening. All in all a fabulous gig with great versatility and wondrous sounds in majestic surroundings.